Joanna’s recent interview with Rep. Jason Altmire put us on the trail of a bronze depicting a Native American. We tracked down Be sheekee, and learning more about the bust’s history got us thinking about the intentionality and interpretation of artwork. First, here’s the bronze bust that Altmire noted. It’s placed in the west stairwell near the House chamber, and it faces Emanuel Leutze’s mural, Westward the Course of Empire Takes Its Way. 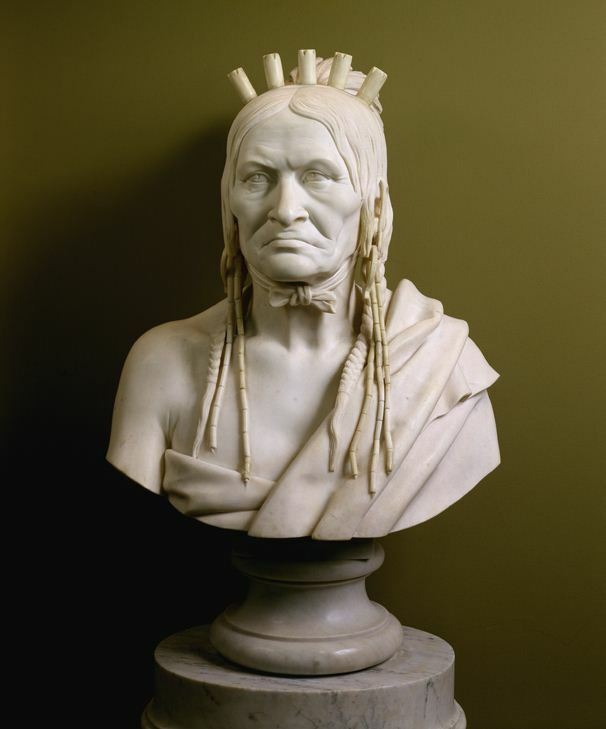 As you can read in the interview, Altmire interprets the placement of the bust and painting as commenting on the way American settlers interacted with and then decimated indigenous populations as they raced across the continent in search of “new” land and opportunities. To Altmire, Be sheekee looks saddened as he views the destruction of his way of life by white interlopers. The pleasure and challenge of art lies in the interaction of audience and artwork. How much does the creator’s intent matter? Should audiences always aspire to understand more about the context of the work’s creation or prioritize their gut reactions? How much responsibility do curators have, given that they are seen as the primary sources of official information about works of art? Is there ever a single correct interpretation or reaction to an artwork? Do any of the aforementioned interpretations of Be sheekee’s expression ring especially true or false to you? How much do you think your understanding of the process of American westward expansion affects your impressions? 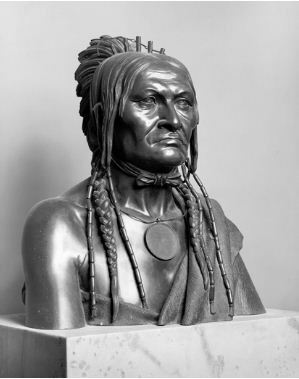 The history of the bust of Be sheekee may or may not change your interpretation. Read on to see! Francis Vincenti, the sculptor, was an Italian artisan employed at the Capitol as a decorative stonecutter during the ongoing expansion; he modeled the two portrait busts in clay and then carved them in marble in a Capitol workshop. Little else is know about Vincenti, before or after he carved these busts in early 1856. In 1858, presumably on Meigs’ orders, another Capitol workman revisited the topic. Joseph Lassalle, foreman of the bronze shop in the Capitol, made a new bust in bronze. Minor differences between the marble and the bronze suggest that Lassalle created a new model or worked from an earlier model of Vincenti’s, but the pieces’ similarities are greater than their differences. It is this bronze version of Be sheekee that is placed near the House chamber. Because Be sheekee’s likeness was taken by men classed as artisans or craftsman, not artists, and was intended to serve merely as a model for an artist of greater magnitude or as a record of a vanishing culture, nothing is known about the creator’s intentions for the work or feelings about the subject, nor did anyone record Be sheekee’s thoughts on the three-day sitting. He had just successfully concluded treaty negotiations with the US government, but that treaty gave Ojibwa land to the US; he died soon after his return to Wisconsin that year. In many ways, this lack information about intent provides viewers a less complex prism through which to view the bust. Nonetheless, we are each full of ideas and opinions about westward expansion and the interactions between indigenous peoples and newly arrived settlers, as were the nineteenth-century creators and viewers of both the bust and painting. Examining our reactions to each can tell us a great deal about the beliefs and ideas we may have ingested and buried deep in our psyches long ago. How does the portrait of Be sheekee fit into or challenge your image of an Indian leader, both in the 19th century and today? Does the energy and swirl of Leutze’s mural seem invigorating, eviscerating, complex, celebratory, painful? What conversation do you imagine the two pieces have with one another? We’d love to read your thoughts in the comments! Kloss, William and Diane K. Skvarla. United States Senate Catalogue of Fine Art. U.S. Government Printing Office, Washington, DC: 2002. Wolff, Wendy, ed. Capitol Builder: The Shorthand Journals of Montgomery C. Meigs, 1853-1859, 1861. U.S. Government Printing Office, Washington, DC: 2001.